Make mornings effortless with this fantastic 2 slice toaster from Russell Hobbs. Thanks to the variable browning options, you can easily prepare toast that’s perfectly golden brown or more well-done – keeping everyone happy round the breakfast table. When you’ve run out of fresh bread, the defrost function comes in really useful, because it can toast those spare slices straight from the freezer. And, if your breakfast goes cold in the morning rush, the reheat option will warm it up again, without browning them further. There’s a handy removable crumb tray as well, which makes cleaning up simple. Does everything that's required of it - makes toast. 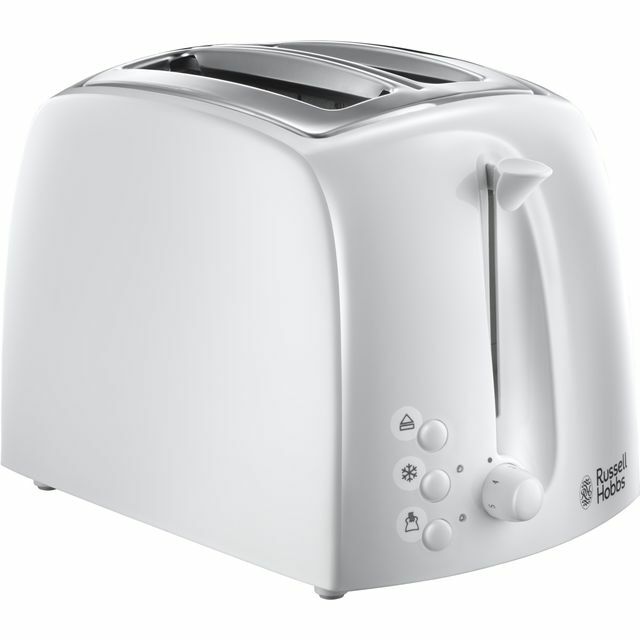 As stated in the title this toaster is well designed with access for wide products, such as hot cross buns or naan bread. Vents at the bottom are wide so crumbs etc go through to the removable tray easily thus it is easy to keep clean. A good buy.